The comfortable and friendly ibis Styles Geraldton sits at the edge of town, close to the airport and 100m from the beach. 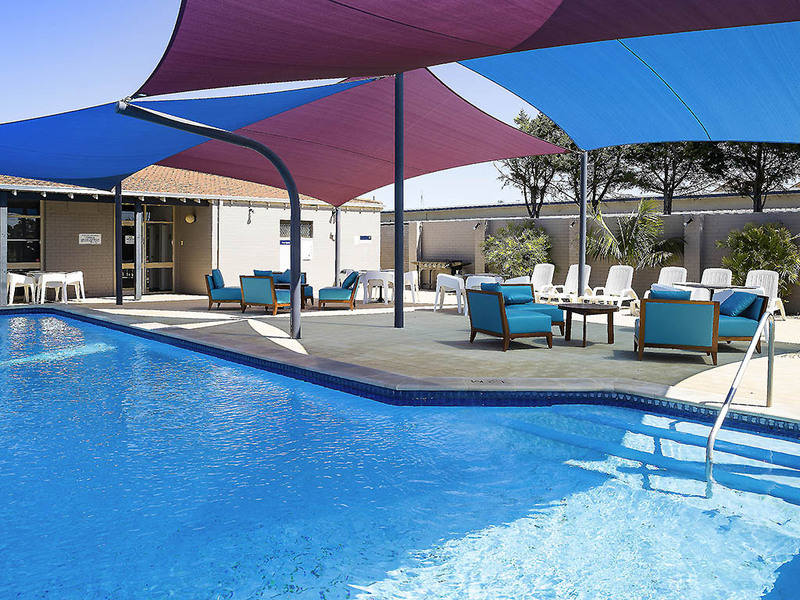 Along with 60 rooms, ibis Styles Geraldton features an outdoor pool, and Fitzies Restaurant and Bar. Located five hours from Perth by car, or one hour by plane, Geraldton is a getaway destination with plenty to offer. Guests staying at ibis Styles Geraldton are just minutes from the centre of town, where a range of attractions, restaurants and shops are just waiting to be discovered. Located five hours from Perth by car, or one hour by plane, Geraldton is a getaway destination with plenty to offer. Guests staying at ibis Styles Geraldton are just minutes from the centre of town, where a range of attractions, restaurants and shops are just waiting to be discovered. Some visitor favourites include the HMAS Sydney II Memorial, the Western Australian Museum, Waminda Wildlife Sanctuary and Greenough Wildlife Park. Guests can also try their hand at kitesurfing, windsurfing and diving. With its coastal location, Geraldton provides the perfect getaway in Western Australia. Guests staying at ibis Styles Geraldton are minutes from the beach, where they can try kitesurfing, windsurfing, diving, swimming or simply relaxing on the beach. Guests staying at ibis Styles Geraldton can enjoy access to wide range of facilities and features, including free onsite parking, in-room WIFI access, business services, and convenient connecting guest rooms, family rooms and reduced mobility rooms. Spacious and bright, guest rooms at ibis Styles Geraldton provide a peaceful retreat just minutes from the beach. Accommodating between two to four guests, guest rooms are available in a variety of configurations. Each guest room at this stylish Geraldton hotel features a range of convenient facilities, including air-conditioning, a TV with free in-room movie channels and Foxtel, comfortable bedding, WIFI access, an iron and a well-equipped ensuite. Fitzies Restaurant offers a buffet breakfast daily as well as a la carte dinner in an informal dining environment. Open daily with bookings recommended. Fitzies Bar is located at ibis Styles Geraldton and is a great place to unwind after a day of exploring Geraldton and the Mid-West Region. Convenient, friendly checkin ans goid resturant. Our welcome to Ibis was warm and friendly. We were given a clear explanation of amenities and our room had been recently refurbished. We love our experience staying at Ibis however on the day the hot water system wasn't working. Would we stay there again? Yes wewould. ABSOLUTELY!!!. The evening meal at Ibis was delicious, Whoow.....!!! Now a genuine ‘home from home’ experience. As a regular guest I am used to the high standards and friendly experience of the Ibis Geraldton. It is nice to be recognised by the staff and the small touches of knowing what drink you like, how you have your coffee in the morning and my poached eggs arriving magically each day. The ‘Golden Touch’ during my last stay to celebrate me becoming an Accor Plus gold member was great fun, discovering my room redecorated with balloons, ribbons, gold chocolate coins and a Gold hat. A very nice surprise to say the least! Excellent welcome/reception experience, food amazing! Lady on reception was very friendly,(Ebony? )efficient and remembered us from last visit. Very helpful with everything and served us again at the restaurant in the evening, food was great and very tasty! Breakfast next day very good and checkout easy! Courteous and friendly staff, excellent breakfast. Don’t judge the book by its cover! The rooms are adequate on the inside and clean. Buffet breakfast was great and I loved the free newspapers and nespresso coffee machine. We had to move rooms due to a broken hot water system but this transition was handled smoothly. Was sent s lovely card by the GM and some Easter eggs for the kids. From the very beginning at check-in (thanks Ebonie for a warm friendly welcome) to check-out, including dinner and breakfast, service and facilities were great. Very special stars for Ebonie at Reception and the Chef for a beautiful diner, great flavours and presentation! The room was clean and comfortable. Continental Breakfast (on special for $2) was a generous and very fresh buffet. I ate in your restaurant the first night. The menu described the beef cheek dish as &quot;slow cooked&quot;. I travel a lot in Europe where cheaper cuts of meat are prefared for the lower cost. They also describe the meat as slow cooked. The difference being that is always is, with great results. The beef I got in your restaurant was not slow cooked and was tough as an old boot. It had been way under cooked and was full of sinews and gristle. A steak knife should have been provided. Apart from a Chef knowing the time needed to soften cheaper cuts of beef, shouldn't he have put a sharp knife through to ensure this. The gravy was salty and obviously a packet mix. The rooms were more basic than I anticipated, but actually were very comfortable when settled in. The restaurant dinner and breakfast was great and very generous with the portions. A Nice surprise - very pleasing. Very impressed by Ibis Geraldton service provided. Yes the rooms are standard motel style, but they were clean and well presented. The staff were fantastic, so helpful and made all the difference to the stay. Highly recommend. staff friendly and helpful, wait staff in morning exceptional. Aging décor, musty carpet, noisy fridge (had to turn off to sleep) neighbouring occupants smoking outside/near my front door-I'm a non smoker. budget accomodation - clean , but very run down and tired. Staff was pleasant and helpful but room and amenities need a refresher .. Bed was old & uncomfortable, plus we had a torn towel in the bathroom. Just the right place for an overnight stay. Spacious, clean room. Good food in the restaurant. The staff was very friendly, room was average but the bed was very comfortable. The buffett breakfast was the best, with a selection of hot and cold items and was able to order poached eggs made to order. I always enjoy staying at the Ibis Styles Geraldton, mainly because of the staff, very professional and friendly. The meals are always a treat as well.